There may be a longshot chance that you are unfamiliar with the mrudangam. 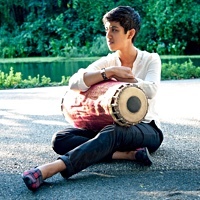 It is a South Indian percussion instrument that Rajna Swaminathan has introduced into American music since she became a part of the New York City jazz community in 2011. She is a protégé of the renowned mrudangam maestro, Umayalpuram K. Sivaraman and tours with him and other Indian musicians. She also collaborates with prominent jazz artists based in New York, including the influential pianist Vijay Iyer, himself of Indian heritage, and saxophonist Yosvany Terry, a Cuban who has been based in New York since 1999. Here they are in concert in Harvard University’s Holden Chapel. Listening closely while letting this music generate its own atmosphere, the Rifftides staff found it curiously relaxing. Perhaps you will, too. Again, the mrudangam player’s name is Rajna Swaminathan.